Although there may be many useful links here, this page is not actively maintained (after 1997). For the latest links see our new Nellis page. Stored on this server or servers affiliated with ours. Area 51. Secret aircraft testing area at Groom Lake, 35 miles west of Alamo, surrounded by Nellis and NTS property. Is it part of the "Nellis Complex"? Semantics! Basecamp Airfield, On US-6 10 miles N. of Warm Springs, auxiliary airfield. Indian Springs Auxiliary Airfield, Indian Springs on US-95. Tonopah Test Range. Aircraft testing base and range support facility about 30 miles southeast of town of Tonopah. Tolicha Peak Electronic Combat Range. 30 miles north of Beatty. Satellite Image* (48k) provided by CLUI. The "Korean" mock airfield is shown in the center. "A Memorial Page for an Air Force worker*, Charlie Price, who died of cancer in 1994, mentions his work at Angel Peak during atomic testing at the NTS. Schedule of Nellis Combat Exercises*: Dates of upcoming Red Flag and other publically announced combat exercises on Nellis Range. Nellis "Site Characterization Project"* by Center for Land Use Interpretation. General map from 6/4/96 article in Las Vegas Sun . Another Frequency List (4k), much shorter, of unknown origin. "New commander at Nellis excited about his team," By Susan Greene. Las Vegas Review-Journal , 5/6/96. Air Force Maj. Gen. Marv Esmond, a top fighter jock, returns home to Las Vegas and the thrill of a new job. "State wildlife officials reach hunting pact with Nellis Air Force Base", Las Vegas Review-Journal , 11/21/95. "Sheep hunters obtain access to Nellis range," Las Vegas Sun , 11/20/95. Pilotless aircraft lifts off from Nellis Air Force Base, 7/28/95, Las Vegas Sun . Former Nellis Commander Thomas Griffith suspended for adultery. "Cultures clash on the range: Air Force, Indians seek common ground at Nellis," By Richard Levy. Las Vegas Sun , 6/4/96. Detachment 3, Air Force Flight Test Center (AFFTC). This unit, based at Edwards Air Force Base, apparently operates Area 51 and is cited by former workers as being "at" Nellis. Nevada Test Site. 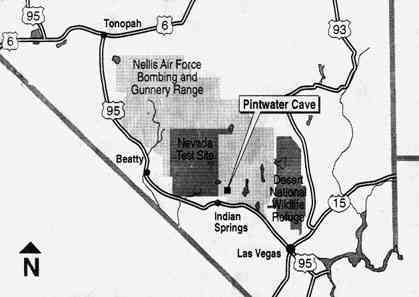 Nuclear testing ground, surrounded on three sides by the Nellis Range. Yucca Mountain Project. Proposed nuclear waste storage area. Col. Bud Bennett (now retired). Represented Air Force at White Sides withdrawal hearings. References. Books and articles about Nellis, except breaking news..
Red Flag: The Ultimate Game . 1981 made-for-TV movie, melodrama. 99th Range Group. Manages the Nellis Range. Nellis Range Renewal. Good overview. Personnel, arranged by chain of command. Search Las Vegas Sun for recent stories on: "Nellis"
Formerly Used Defense Sites (FUDS) in Nevada, a database from the Army Corps of Engineers, includes many maps and interesting documents on Nellis-controlled areas. All maps and documents are in a crude Tiff format. Translate them to jpg for more attractive display. Site location map (265k Tiff). Shows location at Angel Peak and access roads. General layout map (93k Tiff). Close-up of facilities. See Area II for other FUDS links. Brochure describing Nellis Range Complex from MRTFB (Air Force) site. Recommended! Aerial Photo of Las Vegas (296k) shows Nellis and Nellis Area II in upper right corner. Site Characterization Project on the Nellis Range from Center for Land Use Interpretation. Many interesting map samples. Nellis Terrain Data. Technical. If you can figure this out, please let us know. Lockheed-Martin, the primary contractor for range operations. Purchased the former contractor, Loral. DOD TECNET. Test and Evaluation Community Network.